For the longest time I resisted reading anything by someone with the name “Starhawk”-it screamed “New Age” -i.e. fuzzy,sloppy thinking that rejected both politics and science and embraced consumerism. 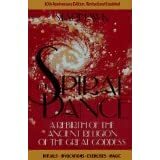 But I was wrong- you don’t need to be a Goddess worshipper to appreciate the intelligence/wisdom in this book. I found that a good place to begin reading this book was actually starting near the ending.